Discussion in 'The Refreshment Lounge' started by Blake Bowden, Oct 2, 2009. No I have not. That is the best. I needed that. how is he even holding it? lol. Man I keep coming and looking at that and laughing while saying, "Damn, that is one pissed off guy." yep. you're right. it mos def takes something along the lines of PCP to get someone that cranked up! nah,i swang a cactus once..you just got to find the sweet spot to hold on to.back in arizona,we usedd to play baseball with rocks and cactus for bats. nah,i swang a cactus once..you just got to find the sweet spot to hold on to. I am thinking of so many things to say. But cant commit any to writing. SO just know that you're half a sissy. No offense. I'm just saying. He must have really loved that car! 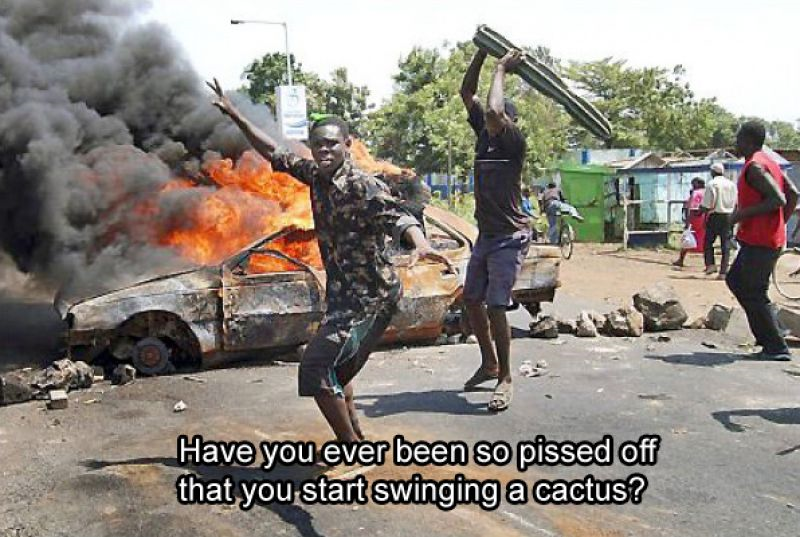 I can think of one reason why I would swing a cactus like that, just not right now. i knew you would cave in and change your avatar.